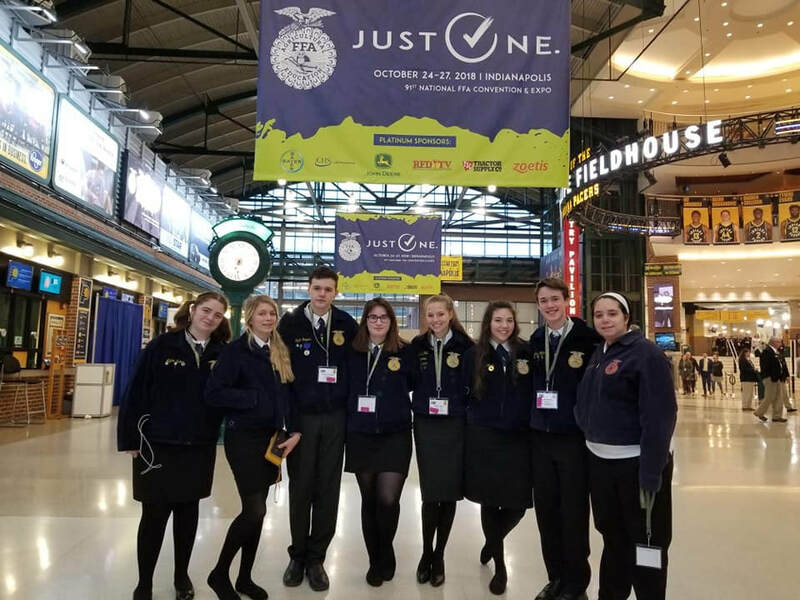 Exeter FFA attended National Convention in Indianapolis, Indiana, from October 22 through October 27. The eight students from Exeter were able to explore the career show which hosted college representatives, welders, veterinarians and many others employed by the agricultural industry throughout the nation. Students were also given the opportunity to tour parts of downtown Indianapolis, see Garth Brooks in concert, tour a local dairy as well as tour Conner Prairie in Fishers, Indiana. The FFA chapter ended their trip by watching President Donald Trump speak about agriculture in a special appearance on Saturday afternoon before heading home. National Convention was a great opportunity for students to meet new people and develop and practice leadership skills. Those in attendance included Macy Barrett, Mykah Estes, Makenzie Hopper, Wyatt Hoppes, Muriel Horn, Riley Still, Vanessa Ward and Lane Willis. Pictured above, from left to right: Mykah Estes, Macy Barrett, Wyatt Hoppes, Muriel Horn, Riley Still, Vanessa Ward, Lane Willis and Makenzie Hopper.